Early Whitcomb's family needs a miracle. Their Iowa farm has been in the family for generations, but a long drought has withered their savings and left them in debt. Meanwhile, the great Chicago and Northwestern Railroad wants their land, and if the Whitcombs can't pay their loans, the local banker, Judge Fuslin, will foreclose and sell the farm as his own. 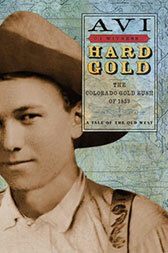 Early's uncle (though he's more like a brother), Jesse, thinks he has the solution: to head West and dig for gold. Fueled by reports of prospectors striking it rich in the Rocky Mountains, Jesse can't think about anything but gold, and his determination to get to the western territories grows stronger by the day. Early is wild to go with him, as much for the adventure as for the gold. But the journey costs money—more than the boys can afford—and when Jesse flees during the night, after being accused of a robbery, Early doesn't know what to believe. Then Jesse sends an electrifying message—that he has found gold, but his life is in danger—and Early knows he must do whatever it takes to find Jesse, even if it means running away and joining a wagon train with a strange family. The journey is dangerous and full of hardships, and the closer the travelers get to their destination, the more ruined lives they encounter—lives consumed by the hunt for gold. Then, to his horror, Early learns that Jesse has been accused of another, much bigger crime and has fled to a secret place in the mountains. Somehow, Early must get to him without leading Jesse's pursuers right to his door. And even if he succeeds, Early will still have to make the hardest choice of his life.